Coll. No. 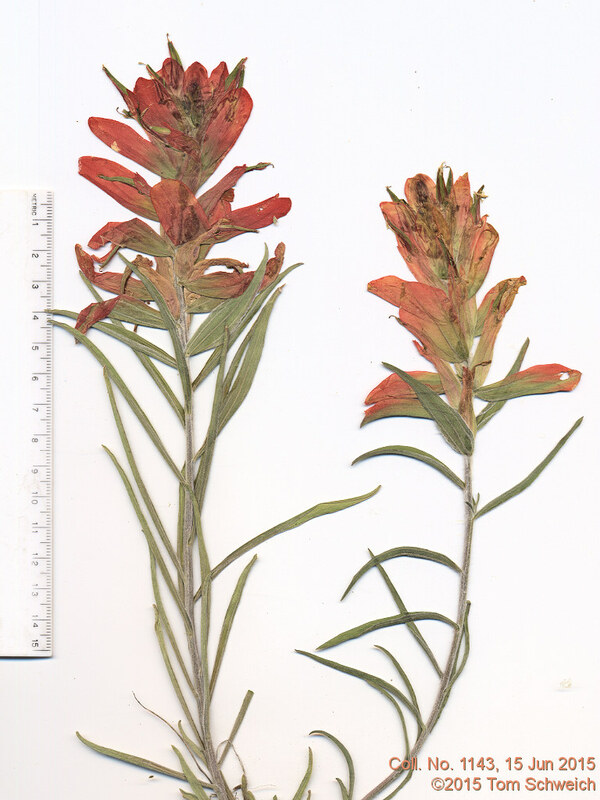 1143, 15 Jun 2015, characters observed: Perennial herb, to 30 cm. ; Stem, tomentose throughout; Leaves, cauline, sessile, 90 mm. × 5 mm., narrowly lanceolate, entire; Bracts, 36 mm. × 11 mm., elliptic to oblanceolate, entire, green at base to red-orange; Calyx, tube 25 mm. + cleft below 10 mm. = 35 mm., cleft above 8 mm., light green to tips red-orange; Corolla, 36 mm. Field Notes: Coll. No. 1143, 15 Jun 2015.